The MIL-DTL-38999 Series II connectors are bayonet coupling subminiature configuration with a low profile design using a shorter socket contact than used by Series I and III. 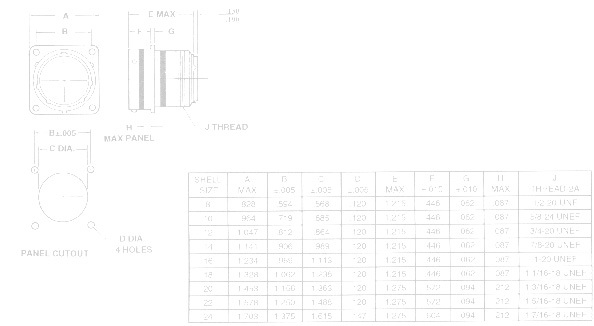 This series is used for instrumentation applications where space is at a premium. Series II is not scoop proof. Series II is available in nine shell sizes with five receptacle configurations and standard or RFI plugs. 54 insert arrangements using 3 to 128 contacts terminating wire gauge sizes 28 through 12. The hard plastic socket interface features the chamfered conical entry that aids in proper contact mating. The fluorosilicone interfacial seal has conical risers around each pin contact that compress into the socket interface, assuring the seal of the mating surface. Cadmium over Nickel, Anodic and electroless nickel finishes are available for aluminium shells.